"I created this dish after getting tired of all those yam recipes using brown sugar and marshmallows. This makes sweet potatoes taste more like they should - a side dish rather than a dessert. Also, you can easily adapt this recipe to vegan simply by using soy cheese. It's worked well for me in the past." Preheat oven to 350 degrees F (175 degrees C). Grease a 9x13 inch baking dish. In the prepared dish, make a single layer of sweet potato slices. Place a few onion slices on top, dot with butter, and sprinkle with salt and pepper. Repeat, alternating layers of white and sweet potatoes. In a small bowl, or measuring cup, combine flour and broth. Pour over potatoes. Sprinkle cheese, bread crumbs and parsley over the potatoes. Dot with remaining butter. Cover. Bake in preheated oven for 1 hour, or until potatoes and onions are soft. See how to make a rich, creamy potato casserole with a crispy top. Lacks a lot of flavor, definitely needs more salt and herbs. I added sage. It was also much too wet. I had to drain the extra liquid out. 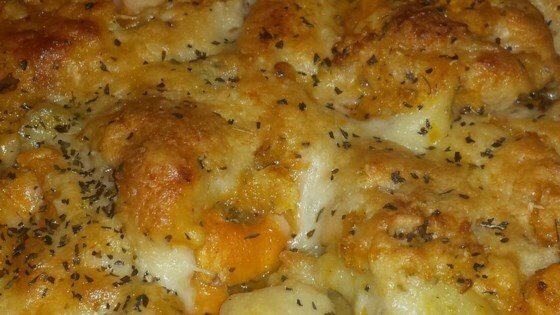 I used Monterey Jack Cheese and chicken boullion instead of Mozzerella cheese and veg boullion. -only because it was in my fridge. Excellent side dish with Turkey! What a great change from the usual sweet potato casserole. I used more sweet potatoes than white and also mixed chicken broth and half and half and it turned out delicious. This was good but I felt it needed something more. I am going to change the butter/chicken stock ratio next time to make it richer. Nice change from the usual sweet potato recipes. We enjoyed very much and would definitely recommend.